It’s pretty nifty that you can take care of the environment and, at the same time, help save the lives of unwanted and vulnerable cats and dogs! As a tiny regional charity, we’re always struggling to make ends meet. Our vet costs are huge, often unexpected, and consume the lion’s share of our annual income. 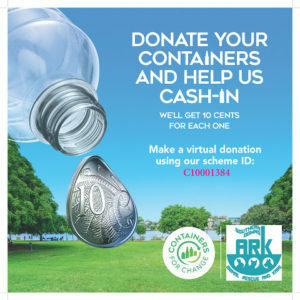 If you want an almost painless way to support us, please take your eligible containers to the nearest Containers for Change depot and donate your refund to our Scheme ID, which is C10001384. Alternatively, if you live in the vicinity of WARWICK or are planning to visit this beautiful area, we hold a CONTAINER COLLECTION DRIVE on the second Saturday of every month at the Uber Markets in Leslie Park, Warwick from 9.00 am. You can drop your eligible containers off at our stall and we’ll do the rest. The refund from every can and every bottle gives rescued animals a second chance at life.